Halen's whole life is being turned upside down when she finds out she's part of a world she's never even heard of. Her true identity was kept from her to prepare her for a mission, a destiny only she can fulfill. Halen is a siren, which means she's half-human and half-Elosian. Elosia is an underwater realm, a place Halen has never heard of, but has to get to know quickly, so she'll be able to save herself and many others. Halen has Tage by her side to protect her and there's Dax, the boy who keeps being a mystery to her. Who is he and what does he want from her? Halen is being prepared to do something that's inevitable, she has to fight Asair. He's locked away, because he's a danger to many different species and only her magic can release their world of his threat. Will she be able to do what's being asked of her and now that Halen has found out she has magic, will she be able to control and use it or will the costs be too great? What should she do and who can she trust? 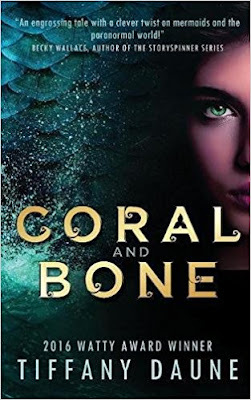 Coral and Bone is a gripping story about a girl's struggles with a huge responsibility that's being foisted upon her. Halen doesn't know about sirens, shifters, hunters, Elosia and underwater creatures. She was kept in the dark about her magical abilities and her purpose in life. She has a twin sister she's never met and discovers that the life she used to live was one big lie. Now she has to adjust quickly and I admired her resilience. At first she has no idea where to start and who is with her or against her and she's reluctant to use magic and to do what's being asked of her, but she slowly finds her strength and learns how to listen to her own intuition. That makes her a powerful main character and I couldn't wait to find out if her mission would succeed or not and how she'd handle the scary situations she finds herself in over and over again. Tiffany Daune's world building is amazing. I was instantly impressed by the different realms she's come up with. Elosia is a fascinating dark place with many dangers. The mystery around Halen's circumstances kept me on the edge of my seat. I was curious to find out who her enemies and friends really are and loved the unexpected and complex ending of this first part of The Siren Chronicles. It's a fascinating series. I love books about underwater worlds and I was definitely enchanted by this one. Halen and Dax have a connection. He is her guardian and she needs his support, but can she trust him with her secrets? There's something Halen is scared to share with anyone. She was supposed to kill Asair, but the voice she's hearing in her head sounds just like him. What Asair is asking of her is something she isn't willing to give and she needs all of her strength to keep him from taking over. How can she get rid of him without being able to ask anyone for help? There's a third realm besides Earth and Elosia, Etlis. It has been on fire for a long time because of past grievances. Those fires are now threatening Earth as well. Halen has a difficult journey ahead of her. One that reunites her with her sister Natalie, reveals more secrets that have been kept from her and might change her entire world view. Halen doesn't have much time, she has to make quick decisions, choose the right side and protect those she holds dear. Can she do it and will her immeasurable powers be enough to make her plans to defeat the evil Tarius once and for all succeed? 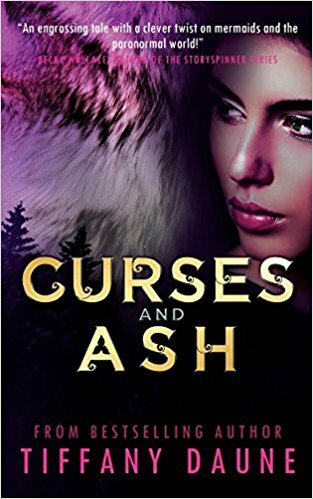 Curses and Ash is another thrilling story about Halen's quest to save Earth and Elosia. She finally learns more about Tarius and the evil games that have been going on for a long time. She needs allies, but she also has to learn how to rely on herself and her own judgement. Her story is action-packed and interesting and I was glued to the pages, anxious to find out more about old feuds, schemes and secrets. Halen is an ideal main character. She's brave, impulsive and intuitive. I love her spirit and enjoyed reading about her very much. Tiffany Daune has written an intriguing series and The Siren Chronicles aren't like any other underwater story I've ever read. I love the way she writes about magic, it's vivid, powerful and original. Curses and Ash captivated me from beginning to end. I liked the way she explores the relationships between Halen and those around her, they each made me curious to find out more and to keep reading. Her colorful descriptions of the realms she's writing about are making them come to life in an amazing way. I absolutely loved this whirlwind of a story. Halen lost part of her goodness because of sacrifices she had to make to save others. She has to find a way to get rid of the darkness inside her. She's also resisting her connection to Tarius, the evil that keeps wanting her to surrender and become his. The battle she has to fight has been going on for a while and Halen has lost so many allies and loved ones already. She's been separated from her twin sister Natalie once more and in that same moment she also lost sight of the man she has a complicated relationship with, Asair. Will she be able to find them again before it's too late? Halen has to deal with an unconscious Dax. They're still united in a way she isn't comfortable with. She has to find a way out of this situation, but how? Halen's mother has left her some last clues to help her with her mission, will she be able to get to the bottom of them or are her enemies quick enough to prevent her from figuring out what she really meant? When darkness finally gets his hands on Halen will she be able to resist its call? Can she win the battle or will everyone she loves be lost because of a connection she's made in a past life? Smoke and Ruin is another action-packed story by Tiffany Daune. Halen is confident and brave, she knows what needs to be done and she doesn't hesitate any longer when she has to put herself in danger. She's become a true warrior and that's what's needed to have a chance in the battle against Tarius, the evil she never wants to be reunited with. However, Tarius is a magnificent opponent and Halen and her those who are on her side are having a hard time fighting him. I was anxious to find out how their conflict with one another would end. 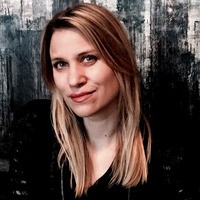 Tiffany Daune has a captivating descriptive writing style. I admire her vivid imagination, which makes her worlds come to life incredibly well. There's so much going on in Halen's life and I enjoyed finding out more about secrets, ancient promises and complex alliances. I enjoyed the roller coaster of events, the amazing sense of adventure and the fantastic gripping scenes in this book. It also has an impressive finale, that I liked a lot. I absolutely loved reading this mesmerizing unusual series. If you love gripping fantasy about underwater realms, complicated relationships and magic you should definitely read The Siren Chronicles. Tiffany Daune writes stories about magick, love and dark creatures lurking in the shadows. She is the best selling author of The Siren Chronicles and a Watty Award winner. When not lost in Editland, you can find her reading a book from her towering TBR pile or kicking back and watching movies with her family. She lives on an island, in the Pacific Northwest, surrounded by mermaids that are much nicer than the ones found in her books. I absolutely love writing and reading on Wattpad. My sister was the one who recommended the writing platform to me when I was struggling to find readers and others to chat about writing. When I first joined, I kind of hid in a corner and took some time to figure everything out. There is some absolutely amazing talent on Wattpad, which is both a little intimidating, but also incredibly inspiring. I started by posting a chapter a week, while reading Wattpad stories and building my library. Reads were slow, but I kept posting, reading stories and commented on works I loved. As I grew a little braver on the site, I entered a contest and won! I couldn’t believe it. Like I said, the talent is through the roof. My story was recognized by Wattpad and featured, which led to readers finding Coral and Bone and eventually to a Watty Award (this too, I still have a hard time believing). Of course, I wanted to give back to his amazing community, so I joined the Ambassador team for a year, which was such an amazing experience. I met so may wonderful writers who I’m still friends with today. In 2017, I decided to branch beyond Wattpad and query publishers. Oftomes Publishing loved my story, had seen it on Wattpad and offered me a three-book deal. 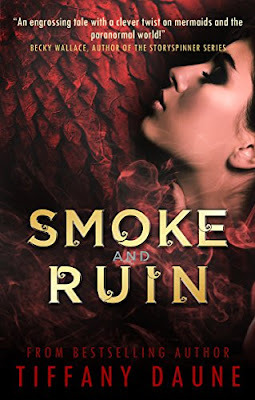 Now, The Siren Chronicles is published and Smoke and Ruin (book three) will be out this February. *pinch me now* I’m so thankful for my start at Wattpad and I still stay connected with my readers and writer friends daily. Not everyone may land a publishing deal from posting on Wattpad, but you will find one of the most supportive writing communities out there. If you’re a writer or just looking for some great reads, then I definitely recommend giving it a try. Hope to see you there! 1. Join the site. It’s free, but Wattpad also started a new paid subscription service. Basically, if you want to read without adds, join, but it doesn’t make a difference to writing on the platform. 2. Set up your profile. Common things to add are your favorite books or TV shows. Tell a little about yourself or let others know why your there. 3. Whether you’re on Wattpad to read or write, you’ll want to start a library. You can add books to your library and create fun reading lists. 4. Add a story. If you’re there to share your writing, you’ll want to create a new story. Simply, add a catchy cover and description (blurb), pick the best category for your story and add some relevant tags. Don’t forget to add the tags. This is how readers find your story. 5. Start writing or copy and paste into the chapters. I like to write in Word and then copy and paste my work into Wattpad chapters, but many just write on Wattpad. Note: Be sure to edit your work! Readers are quick to point out typos (which I love), but if you have too many they may not read past chapter one. You want readers to see your story, not all your spelling errors. 6. Update. I suggest weekly updates, but some writers prefer biweekly or even daily. Find what works for you. When I started on Wattpad, I posted weekly, but my story was complete. For my current WIP, I post when I can. 7. Have fun and always thank your beautiful readers for taking the time to read your work. There are a lot of other things readers could be doing, so it’s pretty special when they take the time to read your work. Also comment on other writer’s stories. Spread the bookish love! If you have any questions about getting started on Wattpad or just want to chat about The Siren Chronicles you can reach me on Wattpad @TiffanyDaune. One very lucky reader of With Love for Books will receive a $25 Amazon gift card from Tiffany Daune. Sounds like an interesting fantasy series about a secret destiny! This sounds like an intriguing and captivating series. I also think it's marvellous of you to give tips for others who're interested in Wattpad. I definitely want to read your books! Thanks for this chance! Yay! Thanks so much. Happy reading! Thanks so much for the book descriptions and giveaway as well. These books are right up my street and I could really do with something new to read! Always like adding new authors to the list! I love books about underwater worlds and The Siren Chronicles sounds like a fascinating and engrossing series. Sounds like an excellent fantasy read. Looking forward to reading. Thanks for the introduction to this author. This sounds like a great read and one I would really enjoy! The Siren series sounds cool. 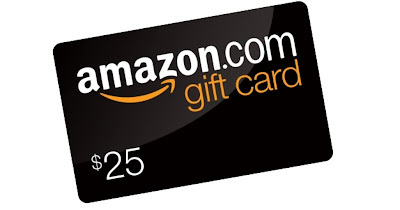 Thanks for the giveaway, love Amazon! I don't think I have read about an underwater realm before so I definitely look forward to this one! Fantastic. Will have to discover the series. This sounds like an amazing series. I look forward to reading it. Sounds good. Thanks for hosting. looks like a great read, I love the cover! thanks for introducing me to your book! I`ve never read a book about this type of stuff before and I haven`t found a book that makes me want to read a book like this. But your book series sounds really good and now I`m excited to get them and read them. Hey Tiffany, this series sounds EPIC! Thank you for the chance. Sounds great! Can't wait to read these books! Wonnderful book covers! I'd love to read your books, sounds amazing. Sounds like an intriguing series can't wait to read it. This looks like an excellent read! Thanks for sharing and for the chance! Sounds like a thrilling series. These are right up my alley! I always enjoy learning about new exciting series. I'd be interested in reading these books. I admire your imagination! How wonderful to write about "magick". I love it when authors share a playlist for their books. It really fuses together my two big loves of music and reading. id love this so i can buy more books! I am easily drawn to the darkness (books). The review sounds wonderful. I love world building and vivid imagination. Thank you for the giveaway. I love your cover art for your books. Your book is what got me through a one-sided Valentine's Day this year! Thank you! I would like to give thanks for all your really great writings, including Coral and Bone, Curses and Ash & Smoke and Ruin. I wish the best in keeping up the good work in the future. A super guest post, I have never heard of Wattpad but I'm sure that platform is of great interest to a lot of people on this blog. Your tips on how to go about writing on Wattpad will also be invaluable to those starting out on the fascinating journey of being a writer.